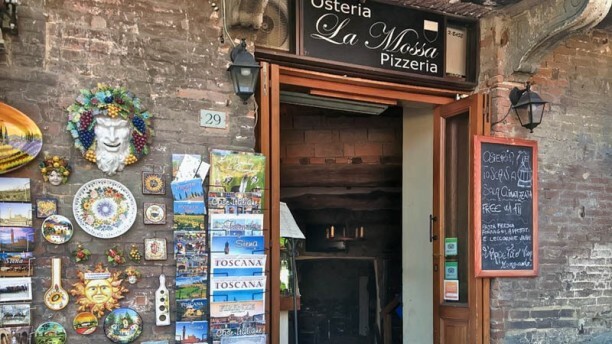 CARATTERISTICO - Nel cuore del centro storico di Siena, si trova il Ristorante Osteria La Mossa. Un ambiente ampio, cordiale ed accogliente, impreziosito da un arredamento particolare e rustico, caratterizzato dai mattoncini a vista sulle pareti della struttura. DI TERRA - Il locale propone un menù ricco di portate preparate seguendo la tradizione regionale. I piatti a base di carne sono i protagonisti della cucina. Le materie prime utilizzate sono sempre fresche e genuine: questo per garantire elevata qualità. DA PROVARE - Consigliatissimi i pici cacio e pepe, i ravioli zucca, burro e salvia, l’ottima tagliata e la terrina con pecorino e radicchio. We were early and seated right away (the restaurant was empty at 5 pm). Our waiter was new and knew nothing about the wines, so we didn’t get any. The food was adequate/good. Food very good, service helpful and friendly. Good food and attentive, friendly service. Easily accessible location. Casual setting. Enjoyed local dishes and good service. Excellent food, simple but well-prepared with a fine selection of Italian wines. One waiter, however he was excellent at looking after all customers. Highly recommended. Nicely prepared, delicious food. Great pasta and beautiful meat and cheese plates. Good wine by the glass. Friendly service by English speaking waiter. Perfect location right on IL Campo. No outdoor seating, but the the interior of the restaurant is very pleasant. This is a great choice for a tasty, reasonably priced meal on IL Campo with caring service. Excellent location. Great food and service. Very enjoyable all around. So glad we found this little gem in Siena. Buen trato y excelente comida. ¡El osobuco, impresionante! Great service, staff were friendly and welcoming and spoke great English which helped. The food, meatballs and a duck pasta were excellent. Great authentic ambience. We really enjoyed our lunch and would highly recommended. A really nice place with good food. The Osteria is on the piazza del campo so it's a good spot. Staff is pleasant and prices are reasonnable with discount. Great Italian/Tuscan food, friendly waiter, nice atmosphere!